The latest Australian Multi-Screen Report, fresh off the press from Regional TAM, OzTAM and Nielsen, and covering the third quarter of calendar 2015, has shown that Aussies still love their teles. Australians remain heavy television consumers, and to add to this, more choice in platforms and devices is seeing audiences spread their viewing across screens. Most Australians watch broadcast television each week. Broadcast television viewed on in-home television sets reached 87.7 per cent of Australians in any single week of Q3 2015 (free-to-air and subscription channels). Broadcast television reach remains high among all major age groups. For example, 72.2 per cent of people aged 18-24 – a relatively light television-viewing segment – watched broadcast TV on in-home sets each week in the latest quarter. 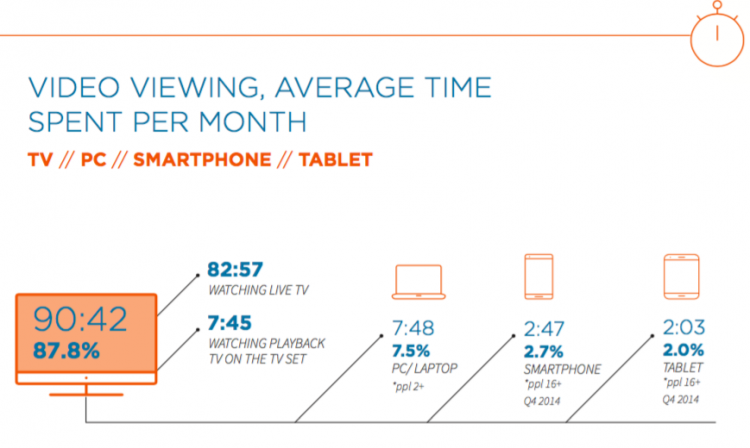 The most time spent viewing video content is on TV sets, with Aussies also using their sets for many other purposes. Similar to recent quarters, on average 16.3 per cent of Australians were using their TV set for any purpose at any one minute of the day in the time period looked at. Time spent on other TV screen use jumped up in the third quarter of 2015 by more than two hours to an average 28:50 per Australian each month. Australians are also using connected devices to watch TV and other video content. Over the entire time period studied, Australians on average watched 90 hours and 42 minutes of broadcast television per month, down 6:16 per month year-on-year and reflecting the way Australians are spreading their viewing across multiple options. Over 12 per cent of viewing is on screens other than TV sets, including broadcast content such as television network catch-up and streaming sites as well as non-broadcast video such as YouTube, Vimeo and Facebook. Head of Nielsen’s Reach Solutions, Southeast Asia, North Asia and Pacific Craig Johnson said, “The TV set remains at the core of video consumption and we don’t see that changing any time soon. OzTAM CEO Doug Peiffer added, “More choice is leading Australians to spread their viewing across content and platform options”.